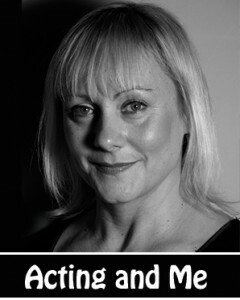 My one Woman Play Acting and Me, was inspired following a workshop with the Eastenders casting director Rowland Beckley. After the workshop I was sharing the experience with my singing teacher Bridget de Courcy. We have always laughed so much during our lessons, as I have always used my humour to keep myself sane in this crazy world of show business. Bridget suggested that I write a one-woman show about my experiences, as there have been so many funny incidences that she thought I could use. This really struck a cord with me. For the last twenty-five years I had actually been thinking about writing a one-woman show. Back then this idea was just a glimmer but I was fascinated by Edith Piaf, Judy Garland, Barbra Streisand and all the great jazz singers from the 1920s onwards. I was always looking for the right subject, it had just never come together. Time moved on and I had my daughter. When she was younger I took some writing courses to keep my creative soul sane. This was the catalyst I needed and I went on to write a play, several short films, two half novels and half a feature film. Also In feeding the flame of my creativity I joined a memoir-writing course to help me finish my autobiographical novel. So coming full circle and from laughing in my singing lessons I realised that I was my own subject. I could tell my own story and if it entertained an audience as much as it had Bridget and I, I was onto a winner. Acting and Me is about telling my story. I wanted to use my singing voice and there is one song which is relevant to the tale. So now the nerves are really kicking in. The 28th of May will be the first time an audience has experienced Acting and Me. What will they think of it? The début crowd will be made up of theatregoers, friends and family alike, many of whom have never seen me on stage before. Will they like it? What will it bring? Who knows? I just hope it is the beginning of new horizons.